Magnetic strips in colors for planning boards, storage racks or whiteboards. Solid quality magnet strips in 6 colors for achieving excellent structure on the board. Easy and economical solution for dividing and organizing content. Flexible product. The magnetic strips in colors are quality products with special flexible abilities. The magnetic strips are intended for indoor use and these colored strips are often used for dividing work tasks on boards, labelling of storage racks etc. The flexible magnetic strip is easy to use and does not require many resources to apply. Cut the required dimension and place label/dymo. It is also possible to write on the magnetic strips with a non permanent whiteboard marker. Please note that the result after removing the text again from the strip will depend on many factors such as the color, brand of marker, pressure etc. If the process of writing and erasing text is repeated color remains will be visible on the magnetic strip. Watch product video for the magnetic strip here. Generally speaking the holding force for the flexible magnetic strip in colors is very low due to the structure of the product. However, it is this low magnetic effect which makes the product unique and highly suitable for applications where the strips need to be easily moved and adjusted. Strength: 29 gr. pr. cm2. The exact holding force will always depend on the surface to which it is applied; if the metal surface is thick or thin the magnetic effect will vary according to this. If the surface is laminated it will reduce the strength. The magnetic strips are not suitable for chatboards – use instead the raw neodymium magnets. Magnetic strips in colors are produced in several dimensions – all with a length of 10 meters. Width between 12-50 mm. See complete list of dimensions and prices under "Sizes and variants ”. The flexible magnet strips are also produced with white laminate for storage rack applications. See the white magnetic strips here. An overview of all magnetic strips can be seen here. 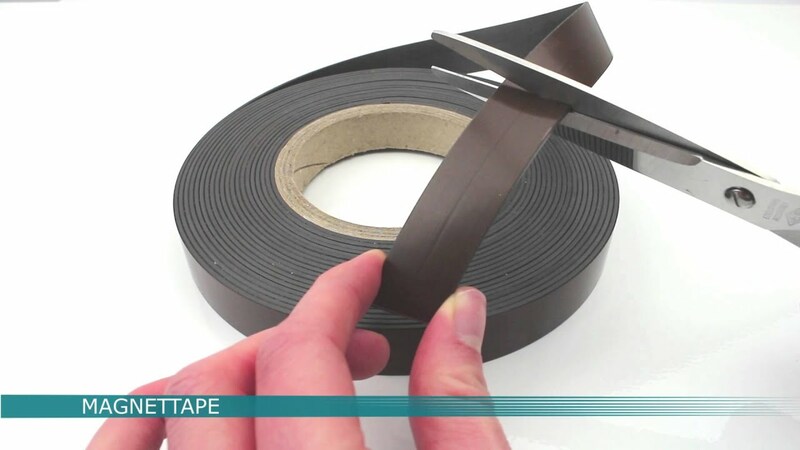 If in need of magnetic strips with adhesive please see the magnetic tapes.